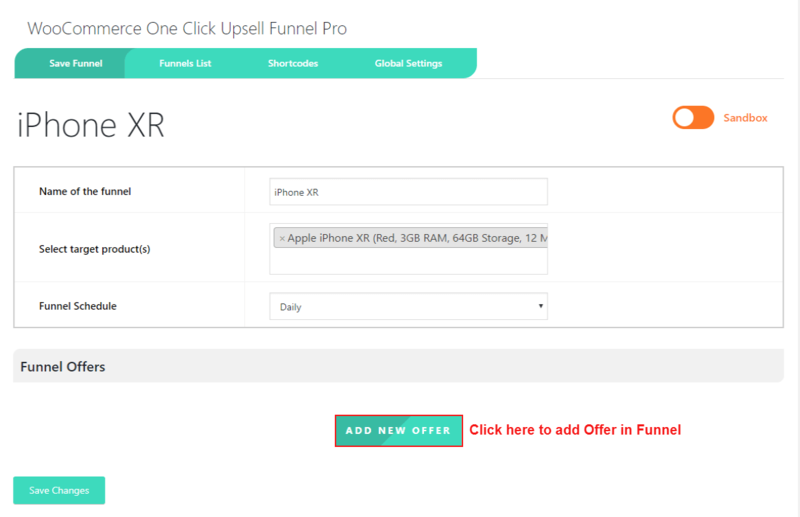 WooCommerce One Click Upsell Funnel Pro automates discount/offer section much easier for your customer. It is highly preferred to place the funnel on top so that the customers can easily access it. It creates advance sales funnels that motivate customers to purchase more and more. 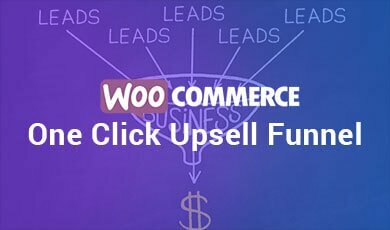 WooCommerce One Click Upsell Funnel Pro extension provide the facility to you that you can upsell your funnel with exciting offers and present to your customers. If the customer does not accept your upsell offer, you can give them another offer that better suits your customer need. A WooCommerce extension that allows showing upsell offers to store customers at the best time when they purchase something from you. Multiple funnels can be created with the offers of your own choice. Create custom offer page with the help of advance shortcode links. Provide 3 predefine offer templates. These are completely customizable with Elementor. Offers can be purchased with a single click only. Funnels can be scheduled for specific weekdays. Customization for showing more new offers if your customer accepts or rejects an offer. Provide full compatibility with Elementor. Secure payment transaction without asking customers for card/account details again. (i) WooCommerce Standard Paypal Integration. (v) Authorize.net and COD, Direct Bank Transfer, and Cheque Payment. Parent products and Upsell products will come in a single Combined Order. Support for only simple and variable products. Increases the WooCommerce store sales instantly. Hikes the store average order amount value by 10% to 25%. Significantly increase your customer LTV ( Life Time Value ). Increase your AOV ( Average Order Value ) per customer. Exposure to higher margin items and best sellers. Overall customer satisfaction by helping to find the product or service that best meets your visitor’s needs. Automatic installation is the easiest option handled by WordPress. Download WooCommerce One Click Upsell Funnel Pro plugin. Navigate to the sidebar, click on plugins. Click on Add New and then hits on Upload Plugins. Hit the browse button and choose your downloaded plugin’s .zip file, and click on Install Now. One click on Activate Link. And the last type Salesforce WooCommerce Integration PRO and hit on search plugin. Once You find the plugin Click on “Activate Plugin” tab. Manual installation of the plugin is another option to install the plugin in the sellers WordPress-environment. 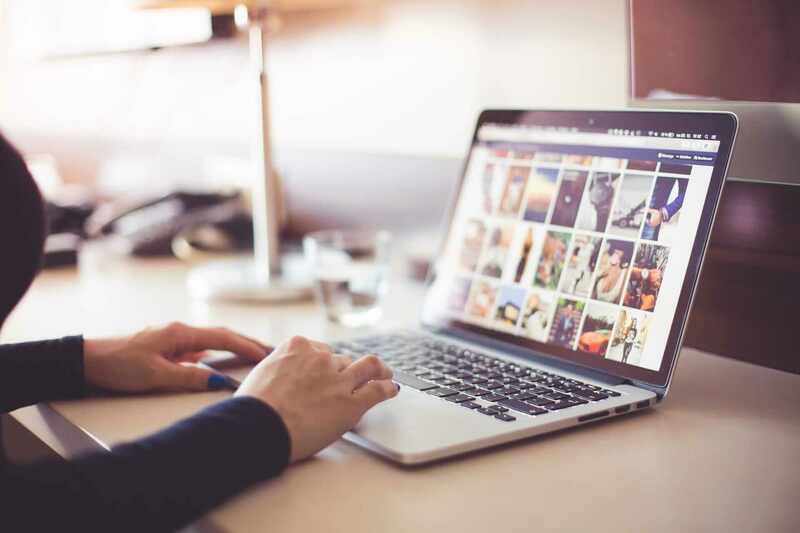 The manual installation method involves downloading our WooCommerce One Click Upsell Funnel Pro plugin and uploading it to the web server via their favorite FTP application. 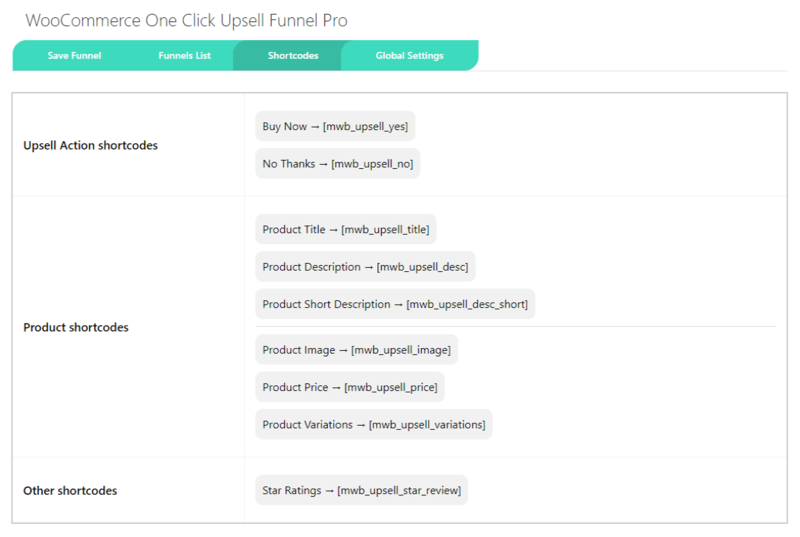 Upload the WooCommerce One Click Upsell Funnel Pro folder to the /WP-content/plugins/ directory. In the “Funnel List” section, admin can start creating the funnel by clicking on “Create New Funnel” tab. The main step to do this is to set the target products in the funnel to which the offers will be applied.  You can schedule funnel for specific weekdays or let them execute every day. (ii) You can just set a new price here for the offered product without the currency. Make sure the price is less than the original price. Later, set the redirection to your offers for if they are purchased or rejected. You can redirect your customers to more new offers if they accept your first offer or if you get satisfied with just one purchase then show them Thankyou page. We are providing 3 inbuild templates that can use the offer page template. Also if you are like to use custom page for offers to show up then create a new page, design well and attach the link to offer custom page URL. And last click on the “Sandbox” tab to make live the offer pages and don’t forget to click on the save changes tab. We are providing 3 predefined offer templates that can be used for the offer page. These templates are fully customizable with the help of Elementor. After successfully creating the funnels, you can view the list of total funnels in this section. Here you can see all the detail of funnels like funnel name, status, target product, number of offered products in the funnel and also take the proper action according to the need. This extension provides some advance shortcodes for design custom offer page of own brand. Buy Now- This shortcode used for “Buy Now” link. In HTML use it as- href =”[mwb-upsell-yes]” of anchor tag. No Thanks- This shortcode used for “No Thanks” link. In HTML use it as- href =”[mwb-upsell-yes]” of anchor tag. Product Title- This Shortcode returns the product title link. Product Description- This Shortcode returns the product description link. Product Short Description- This Shortcode returns product short description link. Product image- This Shortcode returns product image link. Product Price- This Shortcode returns product price link. Product Variation- This Shortcode returns product variations link. From this section, you can enable/disable the plugin functionalities and manage the supported payment gateways for the upsell. You can also apply the global setting for the offer page. Enable Upsell: Here you can enable/disable the plugin functionalities. Payment Gateways: This is very important for Upsell offers, you need to set up the supported payment gateways. Skip Funnel for Same Offer: Skip funnel if any offered product in the funnel is already present during checkout. Remove Style from Offer Pages: Remove theme and other plugin styles from the offer page (Note: Not applicable for the custom offer page). Global Offer Product: Set the Global Offer Product, It view for when no offer product is set(Note: Applicable only for ‘sandbox view’ and ‘custom offer pages’ ). Global Offer Discount: Set Global Offer Discount on the product price(Note: Applicable only for ‘sandbox view’ and ‘custom offer pages’ ). Global CSS and JS: Write your custom CSS and JS for the offer page without any script and Style tags. and at last, don’t forget to hit the save changes button. Here you can setup Upsell with the supported payment gateways. Enable the selected payment gateways that you want to charge your customer. Stripe Settings: The plugin provides a new stripe integration for which you have to set up its settings. Stripe requires the public and secret keys which can get from the Stripe dashboard. 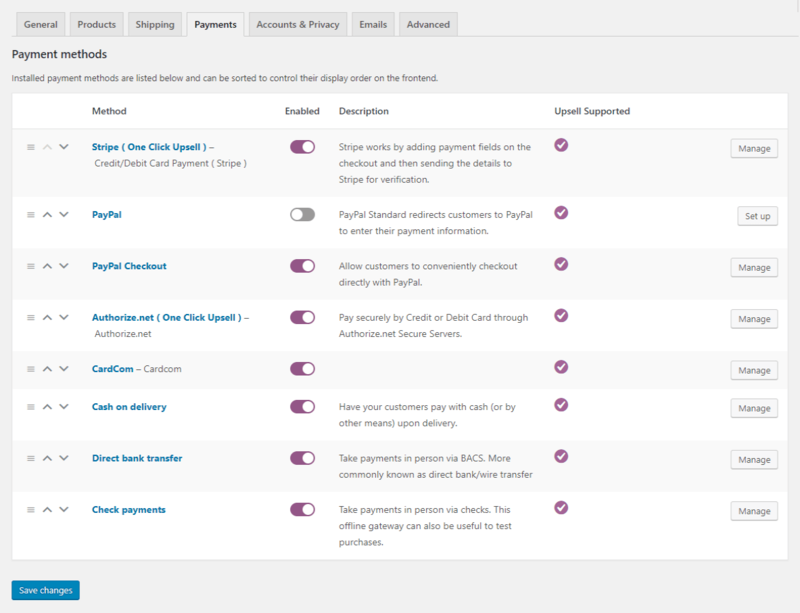 Paypal Settings: The plugin provides a new Paypal integration. PayPal requires Paypal API credentials such as API Username, API signature, and API password. 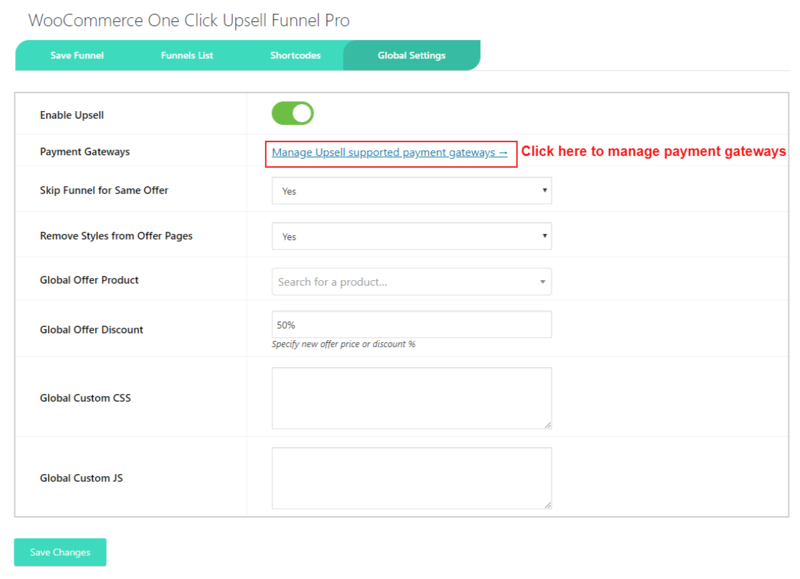 One Click Upsell Paypal Settings This plugin works with WooCommerce Standard Paypal in order to charge for Upsell Orders. So if you want to use WooCommerce Standard Paypal to charge your customers you must use WooCommerce Standard Paypal. WooCommerce Standard PayPal needs API level credentials such as API Signature, API username, and API password. Cardcom Settings: The plugin provides an integrated Cardcom gateway in order to charge for Upsell Orders. So if you want to use Cardcom to charge your customers you must use Cardcom provided with the plugin. Cardcom needs must cvv terminal number and API username in order to work. Authorize.net: The plugin provides a new Authorize.net integration. Authorize.net requires Login ID, Transaction Key, and Authorize.net MD5 Hash Key.